This is a long article but I think it's necessary to fully understand the nature of what she is talking about.. I do a lot of my work via distance work through the phone or via skype etc.. I find it to be a lot more effective then when someone is local or with me in person. In this article she gives a clear reason why this is the case. I cannot stress to all of you enough and even to myself at times the importance of constant meditation, study and practice to fully be self aware.. Self awareness and understanding how our bodies work is vitally important. In late 2011, a trio of scientists discovered that since the big bang happened, the universe is expanding at an increasing pace, not decreasing like previously thought! As long as the expansion is increasing in speed, all life encompassed by the universe is subject to a 'growing force'. When expansion stops, the big life cycle of this universe will be mature, reproduction of the universe will occur and after this, the universe will start to break down and collapse back upon itself in the dying process. This life cycle of birth, growing, maturity, reproduction, decline and death is seen in every life form on earth. Increasing pace means all objects are vibrating faster and are subject to increased vibration each year. This is seen in our sun, which grows hotter and puts out more energy each year. We all know that without the sun nothing would grow, which includes us as we are growing too. When we look at earth's fossil record, we see that life has been subject to this growing force for millions of years and there have been many growth cycles and metamorphosis of new species over time. An interesting fact of physics is "objects gain mass by moving through space". This means the growing force is causing all objects to gain mass, which includes us. From Einstein's famous equation of E=mc², energy is equal to mass times the speed of light squared. As objects gain mass their energy increases and they vibrate faster. If you already understand you are eternal and cannot be destroyed, this means your vibration and mass are increasing with each successive lifetime you have experienced, because we move through space while living in a physical body. Physical life is not what it appears on the surface. The reality is all objects we can see and feel are mostly composed of space. From Nova's Fabric of the Cosmos Series Greene stated: "Matter is mostly empty space. If you take out the space and the mass of the Empire State Building, it would condense to the size of a super-heavy grain of rice." The universe is ninety-five percent invisible space and the same is true of us. That invisible space contains our soul and dark energy, which is intelligent and indestructible. This space gives us insight, creativity, physical form and allows healing to occur in our bodies. Our solid aspect is our visible physical manifestation, but is only temporary and death will eventually transform it. Our energetic aspect is eternal and cannot be destroyed. All materials and forces of the universe are within our bodies. We are part of the universe and thus subject to the same laws of physics that affect objects. Spirituality is the intelligent consciousness that is present in all life and is the center of all the forces of physics. It is the unifying force between the quantum world and world of relativity, that physicists cannot find and we are one with it. This force cannot be detected by observing physical forms. It can only be located by dropping our identification with physical reality and being still. When we are totally still, we are one with this force and we can know it. Human time is a convenience to reference happenings of the past, present and future. It exists as a memory and reference point about something that physically happened in the universe. The passage of time is a sign of universe expansion due to the growing force. If we were past the point of universe expansion, we would no longer be growing and matter would be dissolving. Then we would see the effect of 'reverse-time' or going backwards in time. When you merge fully with dark energy by being entirely still then time stands still and effectively ceases to exist. The standstill of time is the same phenomena known to happen if you could travel at the speed of light. This happens because dark energy is the growing force and when you stop moving you are one with it and thus no movement is detected. An interesting 'spiritual fact' about time is all times exist at the same time. Any specific 'time' can be referenced and accessed by knowing unique qualities about the time in question whether it be past, present or future. This is because each happening has a unique quality of vibration and characteristics, which distinguish it from all other times. Okay, this explanation needs another spiritual fact, and that is nothing is ever destroyed, it only changes it shape. This fact makes distance healing possible for past, present and future events. A living system is like being composed of two objects; there is the manifest part of our physical body and the part not manifest as our spirit or life force. Each is vibrating at a different rate. It is as if we have a strong perfect vibration deep inside us, but the physicality and structure of our body and personality that covers this, prevents the inside vibration from manifesting externally as a whole and perfectly 'in the flesh'. The lower our physical level of vibration is, the more restricted the flow of energy is throughout our body and the sicker and less aware we are. The physical aspect of self is not our permanent or real aspect, rather it is our reflected visible aspect, it represents what we are currently capable to manifest given our self-knowledge and experience. Our potential is contained in our non-reflected invisible aspect, which is our soul, spirit or source energy. This vibration resonates as one with the vibration of dark energy. We can access this energy and be one with it by placing our attention away from our physical aspect. Our energy self is eternal and because we are intimately one with the dark energy field, we have on tap a vast resource of energy and information for healing and self-realization. While any therapy can have this effect, the most effective healing happens when the mind goes still for long periods. Quiet mind happens naturally in sleep at night, but when a person has low energy, there is not enough time in quiet mind at night to get profound healing. Mostly there is only enough time to clean up the current day's damage and degeneration continues. Meditation practice is the best way to attain sustained quiet mind. Once we know this to be true, there only remains the task to practice mediation and learn how to quiet the mind at will. When we detach from our mind, by not using our mind-voice to animate our personality, then our energetic vibration dramatically rises. Using our energy to animate the personality takes a huge amount of source energy. When we stop that activity, our energetic vibration immediately jumps and healing accelerates as well our self-realization level. Dark energy is all around and inside everyone. Everyone has access to it and has the potential to be a healer. I would go so far as to say every human will eventually become a healer, because self-healing is a necessary step to reach further steps in evolution. Everything is energy, humans are energy beings and all problems can be corrected energetically. The roots of human problems are attachment to material forms, or the visible world, which has the inherent problem to hide or veil our energetic reality. Our main physical attachment is to our ability to self-reflect by using our mind and then reacting emotionally from what we are thinking. This creates an illusion of an activated physical entity, or 'personality'. It is this illusion we generate with use of our mind and emotions that we are primarily attached. The longer we stay attached to generation and interaction with this illusion, the sicker we become. Ultimately, only an individual has the power to stop the habit of using their mind-voice to activate the personality, by using their will power, focus and skills of concentration to withdraw energy away from using the mind in this way. The more an individual practices doing this, the more mental clarity, emotional calmness, increased vitality and awareness they will develop. Eventually self-realization will be strong enough, that we will willingly accept the challenge to fully heal ourselves and will gladly do our daily mediation. Energy healing happens due to the principle of entrainment. From physics, we know that everything vibrates. From Newton's Laws of motion we know when two objects meet each other, the vibrations of the two objects will synchronize with each other. The object with higher vibration will slow down and the object with slower vibration will speed up, until the two synchronize with each other and 'meet' to establish 'a line of communication'. 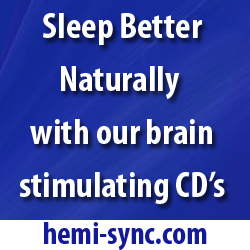 This synchronization process is known as entrainment and only takes a few minutes. After this, the vibration in both objects will accelerate from their synchronized 'meeting point', as long as the objects stay in contact with each other. It is like two energies merging into one stronger force and each person feels vibration increase. As vibration increases, it excites nerve cells and increases energetic flow through all tissues of the body and especially muscle nerve cells. Muscles are elastic tissues, which have the ability to do work in the body by opening areas with blocked or stagnant energy flows. Vibration in the body can be physically felt and electromyography (EMG) is a technique for evaluating and recording the electrical activity produced by muscles. Increasing vibration means healing is happening in both objects, as excitation is opening areas of stagnant energy flow to 'raise' the vibration to a higher level. As vibration increases, it shakes people out of their conditioned habit of using their energy to animate their personality, their mind quiets and they receive a healing in the mind. A skilled healer has the ability to put a person into a deep state of quiet mind for a longer period, thereby providing the opportunity for a clear shot to cure the root cause of any condition, which exists primarily in the mind. Now, I will tell you a secret. The physical object with the strongest energetic vibration you can entrain to (on earth) is another human being. A person who has healed themselves can greatly increase another person's energetic vibration, because their own vibration is higher than most. Getting healings from such a person can give you a large boost to help you heal the cause of your problem and to elevate your self-realization level. Energy healing heals at the energetic level, which is what makes it a very valuable healing method, because energetic flow or imbalance is the cause of physical problem. It works by removing energy blocks and reorganizing the mind and nervous system. It is like opening up an energy channel that previously had low energy flow. As energy channels are opened it increases the overall energy level of the person being healed and allows internal energy to get to the area to heal the physical problem. The actual healing is done by the person's own body; it is not done by the healer. The healer is only the catalyst to elevate the person's vibration through entrainment, to create the ideal condition for the reorganization to happen. The physical change is later manifested as healed tissue in the mind and body, and becomes apparent when the cells replenish with new growth. Because an energy healing changes the underlying energy flow, it can produce healing effects for many months afterwards. 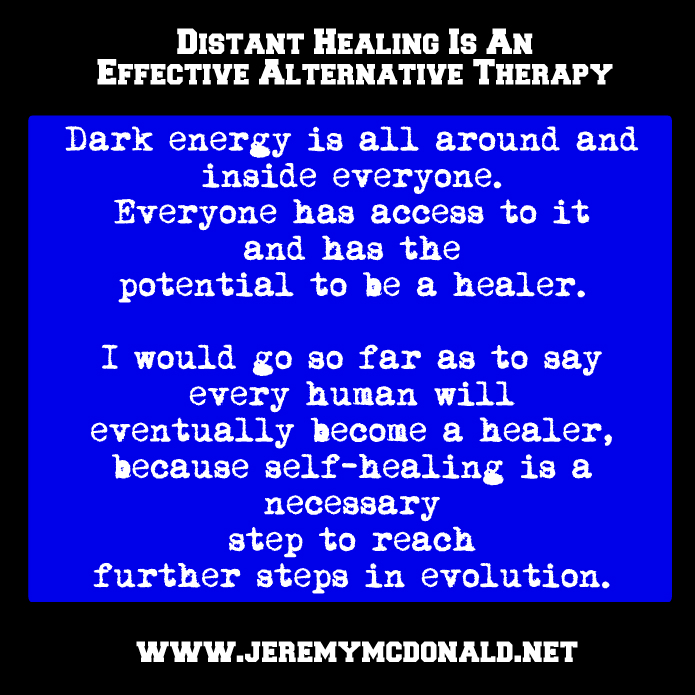 Distance energy healing works just like an in-person healing with a few minor differences. 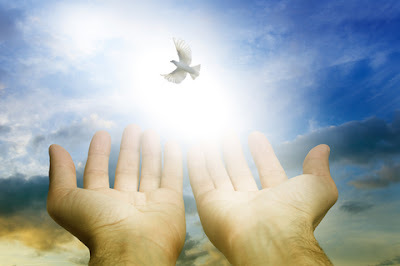 To accomplish entrainment with an in-person healing, a person simply puts their hands above or on the body. With distant-healing, contact is established with a clear reference to the person, place or thing, which includes a date and time. The clear reference is a unique 'identifying' source vibration, such as a photo, name, geographical location, birth date or an object the person once held. A distance healing can happen in any time simply with the healer's intention because all times exist at the same time, sort of like there exist many parallel universes. Each individual has a unique vibration depending on the timeframe, as every living being is changing each second we are alive. The individual characteristics plus the timeframe and location creates a unique 'identifying' signature vibration, which a distant healer can tune into and connect with. Given the flexibility of the time parameter, distance energy healings can be given for past, present or future times. When in contact with a person locally, there is more resistance to being healed. Being physically touched creates reactions and resistance itself. It is hard for people to fully relax and be meditative while being physically touched and in the presence of another person. 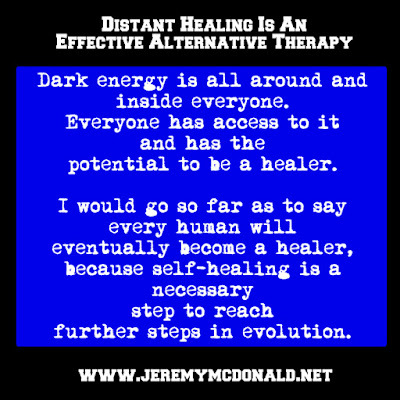 Distance healing can be much stronger than in person energy healing, because a person can relax more. When there is contact at a distance, there is much less personal resistance thus the body vibration can rise much higher as the person is not diverting any energy to 'protect themselves' and healing is more effective. A second reason why distance healing can be stronger than in person healing is the healer can maintain a deeper state of concentration and state of quiet mind, because there are fewer distractions, resulting in a higher level of vibration, which has more healing potential. Distance healing can be very effective for healing all kinds of problems such as headaches, colds, helping people recover from operations or traumatic events, preventing illness, boost energy when facing stressful events, healing past events, healing pets and healing any kind of mental, emotional or physical problem. It is also very effective to increase self-awareness level so distance healing is a type of shaktipat and useful for any spiritual seeker who wants to increase their awareness level. Every day distance healing is becoming more widely accepted into mainstream viewpoints about its effectiveness as more people experience it's benefits. Energy healing is a skill I encourage everyone to sample, learn, explore, and bring into their daily life for maintaining vibrant health and acute awareness. About the Author : Mary E. (Betsy) Rabyor is an intuitive and gifted distant healer based in Wisconsin. As an expert in energy and reiki distance healing she effectively helps people from many countries to restore and maintain health, as well as physical, emotional, mental and energetic balance. 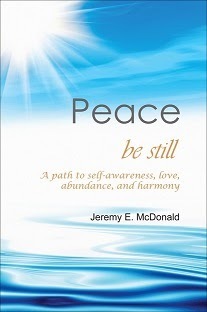 She is author of the book: Our Light Body. Visit Betsy's Distance Healing website for more information.